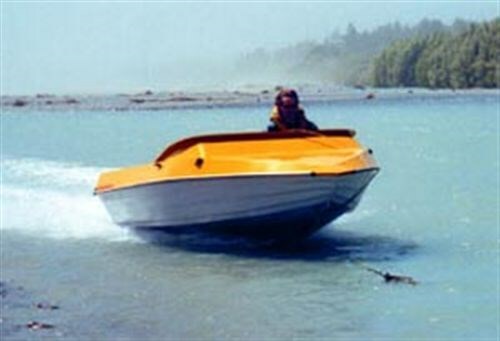 Boss Boats of Te Puke is headed up by Tony Peterson, who spent a number of years working for Tony Ward's Kwik Kraft Boats in Tauranga before setting up his own operation. The company has continued to grow, offering the Sea Boss range of aluminium boats along with its Express range of jet-driven riverboats. Paul Smith reports. The Express 470 is Boss Boats' new release into the very competitive 4.5m riverboat market. While the overall length and beam dimensions, along with the topside styling cues, help differentiate the boat from its competitors, the business end of the hull design follows well-proven parameters. The majority of successful river-oriented jet boats produced today utilise a flat keel plate in conjunction with a moderate deadrise - either at a constant angle across the length of the planing surface (monohedron) or a slightly variable angle, deeper forward, easing back to a flatter angle at the transom (warped). The Express 470 is a variable deadrise design of 19 degrees forward, easing back to 17 degrees at the transom. There are three planing strakes either side of the keel plate, the outer two of which extend fully back to the transom, while the inner strake terminates about half way along the planing surface, its primary purpose being to provide additional lift forward. Such a specification allows for a slightly smoother ride while still providing plenty of lift and lateral adhesion for good shallow water performance. In order to provide a spacious cockpit area and a full-width boarding platform across the transom, Peterson opted to increase the overall length and beam of the Express 470 to 4.7 and 2.12m respectively. Coupled with a generous freeboard dimension of 600mm, the Express 470 is a comparatively big boat for this sector of the market. The Express 470 is ruggedly constructed in marine grade 5083 aluminium alloy. The delta keel section is folded from 10mm, while the outer bottoms are 5mm. The deck and hull topsides are of 3mm and additional strength and rigidity is afforded to the hull topsides courtesy of three clinker style folds and four box section alloy chine gussets. The transom is 4mm alloy while the full-width boarding platform is 5mm. Two full-length engine bearers each side are folded up out of 5mm, and are fully welded to the hull plates. The solid windscreen and reverse deflector are constructed of 3mm alloy. The chines are 50mm wide and well turned down to provide lift and stability while at rest, and the planing strakes are fully welded to the hull plates rather than being stitch-welded as is the case with many other boats. This solid construction provides a stiff and strong monocoque at the expense of some extra weight. The intake grill is slightly recessed into the keel, and is protected by an 8mm steel ride/bash plate, which extends past the transom to provide further impact protection to the waterjet bowl and steering nozzle. 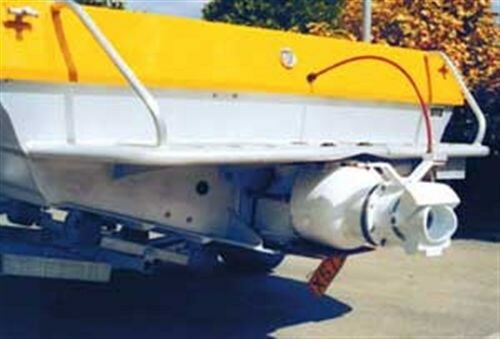 There are alloy bollards welded to each corner of the rear deck to provide secure towing points for a ski bridle or mooring duties as the case may be. Just forward of the dashboard and under the foredeck is a 15mm plywood bulkhead with an access hatch to the fully lined storage locker which occupies the remainder of the under deck area forward. The Express 470 has a very clean and spacious cockpit, with the overall length of the cockpit, measured from the dashboard to the transom coaming of 2.4m, and the width between the wide topside coamings of 1.72m.The cockpit sole is painted marine plywood, while ahead of the two swivelling front bucket seats, which are mounted on strong alloy bases with storage under, are two treadplate alloy footrests. Stainless steel grab rails are spread around the cockpit appropriately. Since this example of the Express 470 was fitted with an in-line four-cylinder engine, there is a substantial 460mm between the engine cover and the cockpit coamings. The fuel tank is mounted just ahead of the engine, is constructed of alloy and has a capacity of approximately 100 litres. An extended double bucket seat is folded into the solid alloy engine cover, which hinges forward from the floor using a solid alloy grab rail to expose the engine, battery and fuel systems. The entire cockpit area is illuminated at night with strategically placed lighting. The flat dashboard houses white-backed Faria marine instruments comprising a tachometer and a composite fuel level, volts, oil pressure and engine coolant temperature gauge. A gang switch operates the navigation lights, cockpit lights, and bilge and fuel pumps. The instrumentation is simple but effective. There is also plenty of space between the back of the front bucket seats and the front of the double bucket rear seat - almost 500mm. This allows easy movement around the cockpit, and the sole is clear right through to the transom, giving plenty of storage room for all those bulky items that are deemed necessary for family picnics up the river. The subject boat had been fitted with a 2.2 litre in-line four-cylinder Opel Vectra engine, which had been marinised by Wasp Marine of Lake Tekapo. The engine has much to recommend it, being of all alloy construction and utilising dual overhead camshafts and four valves per cylinder technology. These brand new engine packages are offered by Wasp Marine fully ready for installation and make use of engine management systems built in Christchurch by Link Electrosystems. The Link ECU controls both ignition and fuel requirements of the engine. Cooling is via a full flow heat exchanger that allows corrosion inhibitors to be used in an effort to protect the alloy engine components as far as possible from the harshness of the marine environment. The undersquare engine (86mm bore x 94.6mm stroke) produces reasonable torque (156 lb/ft at 4400rpm) courtesy of long inlet runners, while maximum power of 145hp is produced at 5400rpm. A compression ratio of 9.5:1 means that 96-octane unleaded fuel is required. Given the quite small displacement of this engine in comparison to most other engines used in jet boats, it is vitally important that it is matched to a jet unit that is capable of delivering adequate performance from the modest power outputs at the appropriate engine speeds. In this instance, the Opel is connected to an American Turbine SD309 waterjet. These mixed flow waterjets are manufactured in Asotin, Washington, and are a clone of the original Berkeley waterjets. These units are usually installed in larger craft in the US, where engines of less than 5.0 litres capacity are considered very small, and have seen considerable success in jet boat river racing where they have been called upon to handle power outputs in excess of 1000hp. Since these mixed flow jets rely more on higher nozzle pressures to generate thrust rather than the greater mass flow of an axial flow jet, they are generally found to perform best with plenty of horsepower - at least 250hp in most instances. In order for the jet to turn at 5400rpm, where the Opel makes its peak power, the impeller has to be turned down so much that efficiency is compromised. In New Zealand, where the market has always been far more receptive to the use of smaller capacity engines, better results have been found by using smaller waterjets that require less horsepower to drive them efficiently. We had the opportunity to drive the Express 470 on the lower reaches of the Waimakariri River, which was just coming down off a spring fresh being still slightly discoloured. A strong, gusty nor' wester was stirring up dust clouds making visibility difficult - not ideal testing conditions. The engine was quick to start and settled immediately from cold to a smooth and steady idle, one of the pleasing features of the modern electronically fuel-injected engines. Once the engine had built a little temperature, we unlatched the winch and the boat slid quickly off the trailer. Immediate impressions were of the steering being extremely direct with about one quarter of a turn of the steering wheel from lock to lock, and quite heavy. The reason for this was later found to be as a consequence of the use of a Morse 43C cable (most commonly used in a jet boat to actuate the forward/reverse mechanism on the waterjet) being directly coupled to the helm. The problem was exacerbated by the American Turbine waterjet having a limited steering lock. With two passengers and a light fuel load, the Express 470 climbed onto the plane acceptably well when the throttle was opened and settled into a comfortable cruise with 3800rpm showing on the tachometer, and a boat speed of about 50kph. At wide-open throttle, the tachometer showed 4400rpm with a boat speed of almost 70kph downstream. The boat itself responded quite well to inputs from the helm, and it rode very cleanly with a slightly bow-up attitude, which I find preferable in a riverboat. The ride in choppy water conditions was also very good, and regardless of the howling wind, we remained free of wind spray, even when the boat was driven hard into turns. The Express 470 is certainly well constructed - it feels very solid on the water, and despite the modest power output of the engine, performs acceptably when lightly loaded, given that it is quite a heavy boat. However, this is a hull designed to carry four passengers and their gear and, as tested, I would say that performance levels would suffer dramatically once the boat was loaded for a family outing. Even so, we gave the Express 470 a thorough trial in a variety of conditions and it acquitted itself quite well, but, and this is a big but, the Express 470 is a boat that cries out for more grunt, especially if an American Turbine waterjet is utilised. Some attention to the steering is also required if this boat is to be a serious threat to other boats in this segment of the market. We found the steering to be too heavy, lacking in feel and too direct, making a chore of the navigation of tight and twisting streams. The standard production American Turbine steering nozzle fails to match New Zealand-built waterjet steering systems in terms of steering lock, sandlock resistance and smoothness of operation, without being additionally burdened by a rudimentary actuation system. For New Zealand conditions, in my view, there is simply no substitute for the chain/sprocket, wire rope and pulley system, which has been successfully used in jet boats for nearly 50 years. Low speed manoeuvrability is also compromised by a largely ineffectual reverse bucket design that is characteristic of the American jets. Performance of this Express 470 would be vastly improved if either a more powerful engine was used in conjunction with the American Turbine waterjet, or if the Opel engine was coupled to a Scott Junior or other waterjet designed to operate efficiently with an impeller sized to allow the smaller engine to develop its maximum power. 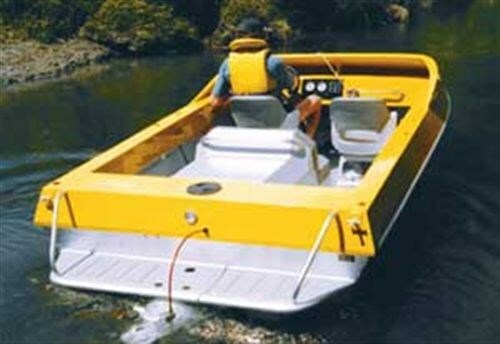 Even so, it is a big ask of the Opel engine to drive a 4.7m boat with a trailerable weight of exactly one tonne as tested. When it comes to performance, power to weight is everything. Even though I was not impressed with various aspects of the performance of this example of the Express 470, I remain confident in the integrity of the design and of the execution of the construction of the hull. The boat has many attractive features, is very well presented and the quality of the engineering workmanship is extremely high. The 470 comes on a galvanised steel, multi roller, single-axle unbraked trailer. At NZ$38,000 including GST as tested, I would have to say to a prospective purchaser that there are other boats on the market which would offer better performance value for this amount of money. However, give me an Express 470 fitted with a 300hp+ engine and a Hamilton 212 or Scott waterjet and a conventional steering system, and I think you would have a boat that is more than capable of competing with any other in this very competitive segment of the market.